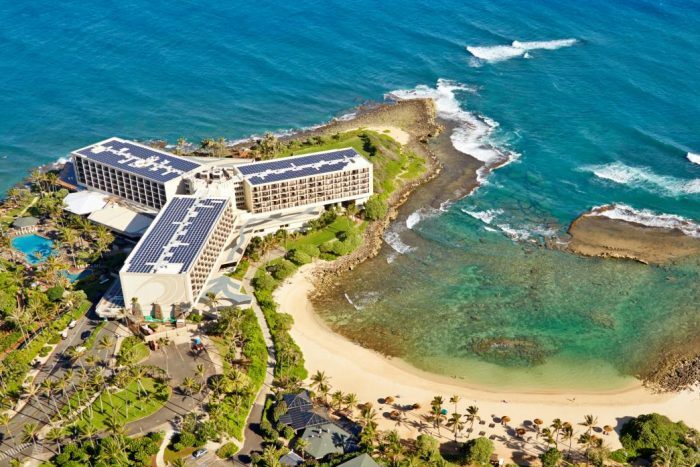 The Turtle Bay resort is located on a remote outcropping of stunning Kawela Bay. A destination wedding here would be one of romantic seclusion, with plenty of opportunities to explore the tropical surroundings. 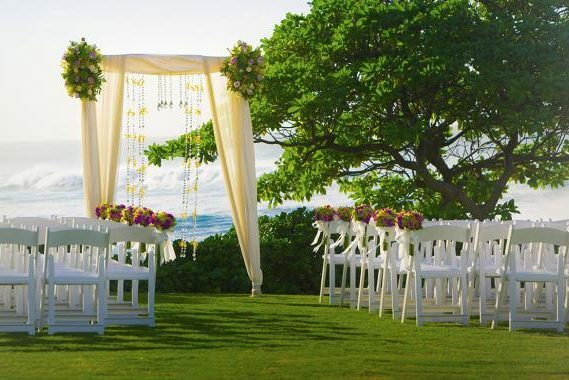 Situated on a northern tip of Oahu, each wedding package has a specific wedding ceremony location as its starting point, and every detail is specially curated to the resort with Hawaiian culture at the forefront. Beyond the upscale beachy-chic rooms you’ll find numerous restaurants, a luxe spa, multiple pools (some saline), and everything else needed to make your destination wedding unforgettable. Ceremony locations are truly unique and even extend beyond the resort grounds. 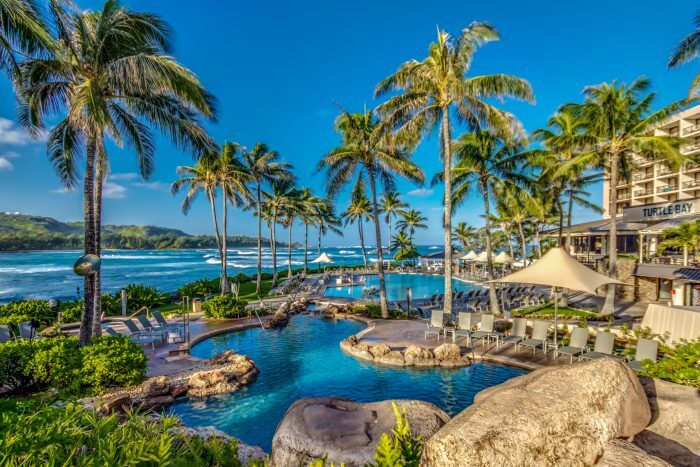 From Kahuku’s public terrace that overlooks a surfer filled beach, to the horse stables lawn that features some furry friends that want to be in your photos, and even multiple beach options. This resort may be better suited for couples who don’t want to leave the property. A car is necessary to explore off-site activities, and the closest town nearby is Haleiwa at about a 25-minute drive. Entry-level packages begin with two options at $4500. It is important to note that most packages require an additional minimum amount that must be spent on food, which is not included in base package price. A-la-carte weddings are also available. Upgraded packages, additional guests, and add-ons are available for an additional cost. 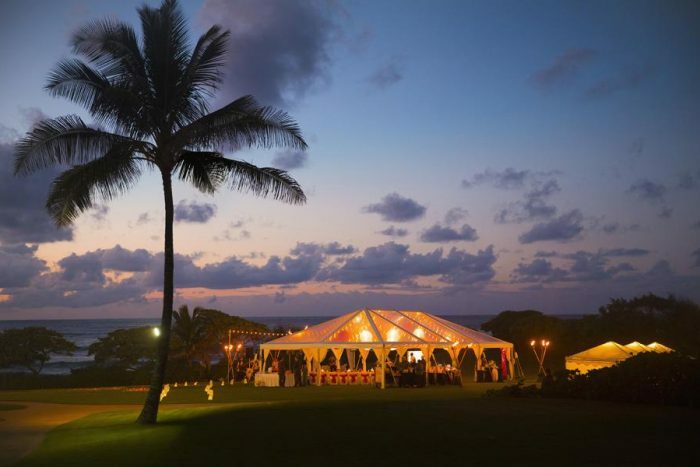 Stables Lawn – 200 guests max., Kuilima Point – 200 guests max, Bay View Beach Point – 100 guests max, Ocean Side Pavilion – 100 guests max, Stables Beach – 100 guests max, Keiki Cove – 100 guests max. 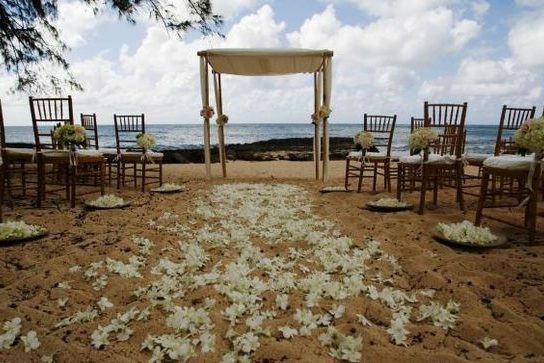 The Turtle Bay resort can host up to 3 weddings per day. $250 – $300 average room price per night, for 2 adults occupancy. Rooms include private balcony or terrace, walk-in shower, and minifridge. There are 452 rooms with ocean, city, or resort views. Due to the sprawling nature of the resort, it is recommended for more active guests. The highest operating seasons for the resort, which high likelihood of resort sellout are March, October and December. This hotel allows a maximum of 4 adults per room. Guests 17 and under are considered children. 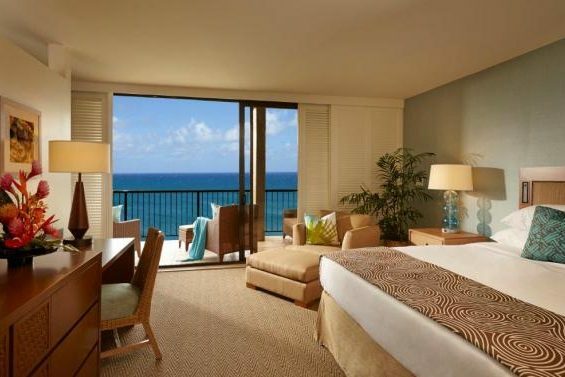 The resort is located 38 miles from the HNL airport. 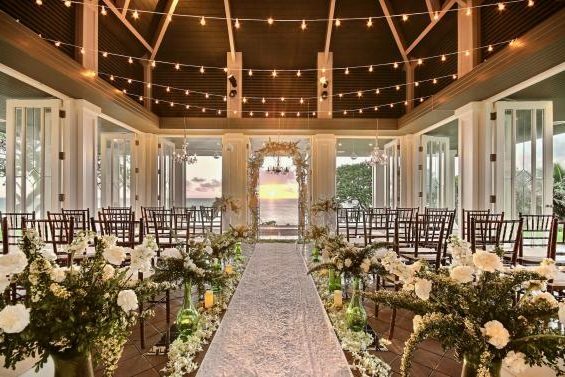 Stables Lawn – 200 guests max, Kuilima Point – 200 guests max, Bay View Beach Point – 100 guests max, Ocean Side Pavilion – 100 guests max, Stables Beach – 100 guests max, Keiki Cove – 100 guests max.